Millions of cars are sold at auction every year. The challenge for auto auction companies is to move and sell cars efficiently, rapidly, and profitably. 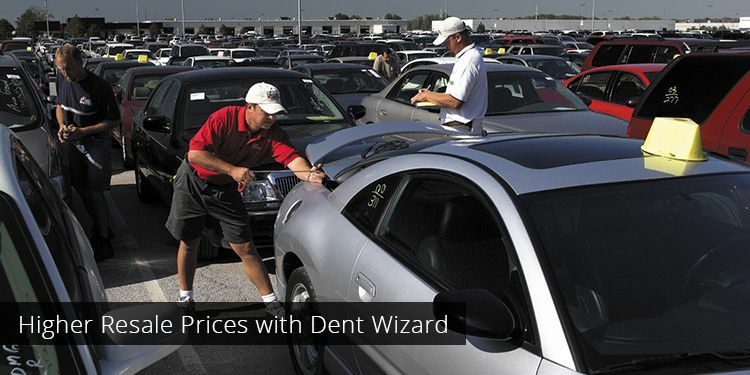 Dent Wizard, the nationwide leader in auto reconditioning services, understands the challenges faced by auto auctions. Our reconditioning services for auto auctions can help streamline your process and enhance resale values of vehicles. They include paintless dent repair, bumper and other paint repairs, wheel repair, interior and glass repairs, or car key programming and replacement services. There are several ways auto auction companies can enhance the value of vehicles they are trying to sell. Dent Wizard works with auto auction companies of all sizes to accomplish this goal cost-effectively and timely. Our offerings can consist of managing the entire auto reconditioning process including body shop and detail services or just complimenting services done by the auction. Our team of highly-trained and experienced automotive reconditioning specialists bring vehicle appearances back to original manufacturers’ quality. Our close relationships with the OEM's allow us to deliver reconditioning services that meet their stringent requirements and are value-added through higher resale prices. Increase your auction profit today by partnering with Dent Wizard for auto reconditioning services. Learn more about our services and costs by calling 1-800-DENT-WIZ (1-800-336-8949) or using our contact form to get in touch with a local representative. Restoring a vehicle’s look while increasing the seller’s profit is essential for auto auction companies. Dent Wizard automotive reconditioning services for auction customers can help you achieve that goal. Learn more about our reconditioning services below or contact us for a custom service package for your auto auction operation. Dent Wizard is the pioneer in paintless dent removal for cars. Our PDR for auction vehicles include removal of dents, dings, creases, and hail damage – even on the body line and on aluminum panels with no paint damage. With more than 1,600 skilled and experienced technicians, our reconditioning team is equipped to restore vehicles to their manufacturer look and feel. Exterior repairs for auction vehicles are for panels, doors, wheels, bumpers, windshields and more. A small tear in a leather seat can decrease the value of a vehicle significantly. Dent Wizard interior repair specialists are equipped to repair dashboard and console, carpet, seat, leather repairs and more, to restore any car to showroom quality. From scratches, gouges and corrosion to bent wheels and peeling clear coats, Dent Wizard's wheel refinishing services are the remedy for wheel damage. From scratches, gouges and corrosion to bent wheels and peeling clear coat, Dent Wizard’s wheel repair services for auto auction companies can add more dollars to your return on investment in using reconditioning services. Dent Wizard’s technicians provide high-quality, long-lasting bumper repairs for auctioned vehicles. Small tears, scuffs and punctures on textured and non-textured bumpers can look new at a fraction of the time and cost of traditional methods. Dent Wizard International is headquartered in St. Louis, MO and has set the standard in PDR since 1983. Dent Wizard repairs over 2.5 million vehicles per year. Dent Wizard provides 100% satisfaction and a lifetime warranty on all repairs. Dent Wizard has been specializing in SMART repairs for over three decades, repairing thousands of vehicles to their original factory finish through technologically advanced, high quality repairs. Learn more about the Dent Wizard Difference. As the world leader in Paintless Dent Repair (PDR), we have been continually improving the capabilities of the Dent Wizard PDR Process for over three decades through our dedication to technology and innovation. Dent Wizard’s advanced techniques effectively remove dents, dings, creases, and hail damage – even on the body line and on aluminum panels with no paint damage. Learn more about Paintless Dent Repair by Dent Wizard and how we can make it work for your business.